5. An incendiary message was shared on the official Facebook page of AMED that was written by its founding director. The message targeted Jewish students for discrimination. INCIDENT: On February 23, 2018, an incendiary message was shared on the official Facebook page of the Arab and Muslim Ethnicities and Diasporas (AMED) program at the university’s College of Ethnic Studies that was written by Professor Rabab Abdulhadi, the founding director and sole faculty member associated with AMED. The message clearly targeted Jewish students at SFSU for vilification and discrimination, and could be read by many as a frightening incitement to violence. Leila Khaled, a convicted hijacker and the most famous member of the Popular Front for the Liberation of Palestine (PFLP), a terrorist organization responsible for 159 terrorist acts such as bombings, armed assault and assassinations, resulting in numerous injuries and deaths including those of more than 20 US citizens. Khaled has been refused entry to Israel, Britain, and Canada. Sheikh Raed Salah, leader of the northern branch of the Islamic Movement in Israel, who was convicted of funding the terrorist organization Hamas and served a two-year prison sentence 2003 – 2005. In 2008, Salah was charged with incitement to violence and racism. In 2010, Salah was also arrested for his participation on the Mavi Marmara, part of the Gaza Freedom Flotilla. Salah was recently incarcerated again on charges of incitement to violence. Evidence demonstrates that Abdulhadi always intended to use the University-funded trip to build relationships with anti-Israel political activists to promote anti-Semitic academic, cultural and economic boycotts of Israel and the meetings were set before Abdulhadi requested University approval. 5/27/14 – AMCHA RESPONSE: AMCHA coordinated a letter from 7 other leading CA and national Jewish groups — including Brandeis Center for Human Rights Under Law, Institute for Black Solidarity with Israel, Proclaiming Justice to the Nations, Scholars for Peace in the Middle East, Simon Wiesenthal Center Campus Outreach, StandWithUs and the Zionist Organization of America — addressed to Timothy White, Chancellor California State University, Leslie Wong, President San Francisco State University, Larry Mandel, CSU Vice Chancellor and Chief Audit Officer, and Carrie Hemphill Reith, CSU Resource Attorney for Conflict of Interest & Governance, asking for an investigation into the matter. 6/19/14 – UNIVERSITY RESPONSE: SFSU President Wong issued a public statement saying that “the allegations against Professor Abdulhadi have no merit,” and that Abdulhadi’s trip was relevant to her research. 6/24/14 – AMCHA RESPONSE: Dismayed that SFSU condone Prof. Abdulhadi’s use of University resource for her trip, AMCHA coordinated a letter with 7 other leading CA and national Jewish groups — including Brandeis Center for Human Rights Under Law, Institute for Black Solidarity with Israel, Proclaiming Justice to the Nations, Scholars for Peace in the Middle East, Simon Wiesenthal Center Campus Outreach, StandWithUs and the Zionist Organization of America — addressed to California State Controller John Chiang asking for an investigation into the misuse of public funds for personal advocacy and meetings with terrorists. 7/22/14 – AMCHA RESPONSE: After receiving no reply from the CA State Controller, AMCHA Initiative co-founder Tammi Benjamin spoke at the CSU Trustees meeting to read out loud a letter signed by 7 other leading CA and national Jewish groups — including Institute for Black Solidarity with Israel, Proclaiming Justice to the Nations, Scholars for Peace in the Middle East, Simon Wiesenthal Center Campus Outreach, StandWithUs and the Zionist Organization of America — calling on the CSU Trustees to investigate. 3/5/14 – AMCHA RESPONSE: AMCHA coordinated a letter from leading CA and national Jewish groups — including the Simon Wiesenthal Center, Scholars for Peace in the Middle East, StandWithUs, and the Zionist Organization of America — demanding that SFSU President Wong and CSU Trustees speak out forcefully against this event and provide counter-programming to educate students about the antisemitic nature of anti-Israel boycotts. 3/26/14 – AMCHA RESPONSE: An audiotape is uncovered that reveals the event was worse than expected. AMCHA Initiative, along with Simon Wiesenthal Center, Scholars for Peace in the Middle East, and the Zionist Organization of America, write to President Wong calling on him to investigate. 12/5/13 – AMCHA RESPONSE: AMCHA Initiative wrote a letter to President Wong asking what concrete steps President Wong had already taken, and what steps he intended to take in the immediate future, to keep Jewish students safe from antisemitic harassment and attack at SFSU’s campus. 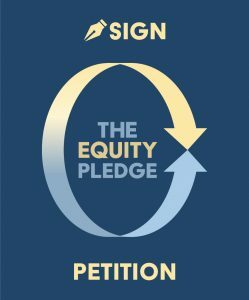 After bullying tactics by GUPS, including a Change.org petition with over 1,000 signatures calling AMCHA Initiative’s concern “a smear campaign,” President Wong issued a tepid public statement calling for commitment to free speech. In response, AMCHA Initiative wrote an open letter to President Wong asking if it is acceptable for a registered student organization receiving university funding to display or use rhetoric that glorifies or promotes violence against Jews, or any other minority groups. AMCHA Initiative has yet to receive a response from President Wong to our latest inquiry. 12/10/13 – AMCHA RESPONSE: AMCHA Initiative writes to Dean of the College of Ethnic Studies, Dr. Kenneth Monteiro, and calls on him to investigate Professor Rabab Abdulhadi’s legitimization of violence, and to condemn those affiliated with the college who misuse university resources for personal agendas. 12/16/13 – AMCHA RESPONSE: AMCHA Initiative replies to President Wong requesting that he clarify his position on whether it is acceptable for groups receiving university funding to incite or glorify violence. 2/18/14 – AMCHA RESPONSE: Dismayed that the University’s silence indicates it is not doing enough to protect Jewish students, AMCHA Initiative alerts law enforcement about the violent SFSU student endangering Jewish students and Israel supporters by writing to San Francisco Police Chief Greg Suhr. 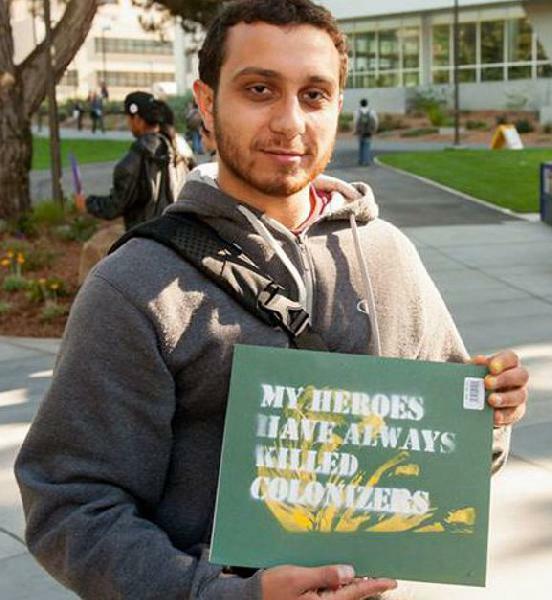 INCIDENT: On November 7th, the General Union of Palestine Students at San Francisco State University hosted an all-day celebration commemorating the 6th anniversary of the Edward Said mural. As part of the day’s programming, there were tables set up in for art projects. On the tables were cans of spray paint and stencils. One stencil was an image of the Palestinian terrorist Leila Khaled. Another stencil bore the words, “MY HEROES HAVE ALWAYS KILLED COLONIZERS,” and in the context of the days events honoring Edward Said, was clearly a reference to the killing of Jews. The stencils were used to make signs carried by students in the plaza. The GUPS event received several thousand dollars of funding from the university and was co-sponsored by the Arab and Muslim Ethnicities Initiative (AMED) in the College of Ethnic Studies. 11/18/13 – AMCHA RESPONSE: AMCHA Initiative alerted President Wong to the antisemitic stencils and asked him to investigate the incident. 11/19/13 – UNIVERSITY RESPONSE: President Wong responded with a statement condemning the stencils, promising to investigate the matter further and to take appropriate action. 11/20/13 – AMCHA RESPONSE: AMCHA Initiative responds to President Wong, thanking him for his public statement. 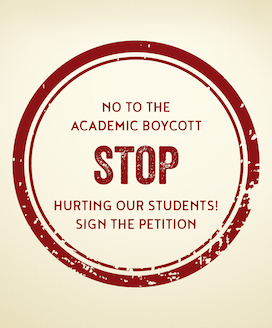 11/21/13 – AMCHA RESPONSE: AMCHA Initiative writes to the Dean if the College of Ethnic Studies seeking a denouncement of antisemitic content at the on-campus event from him. 11/25/13 – LEGISLATIVE RESPONSE: California State Legislators sign a letter to President Wong thanking him for denouncing the senseless acts of intolerance that occurred in the event. 11/27/13 – AMCHA RESPONSE TO LEGISLATORS: AMCHA Initiative sends a letter to the legislators thanking them for their involvement and taking a stand against antisemitism. 12/10/13 – AMCHA RESPONSE TO LEGISLATORS: AMCHA Initiative sends a letter to the legislators thanking them for their involvement and taking a stand against antisemitism. 12/10/13 – UNIVERSITY RESPONSE: President Wong issues a statement asking that we all stay committed to free speech in light of campus event and GUPS President Mr. Hammad’s direct and public threats to behead all who support the IDF.